Okay, OnePlus launched their new phone at an event in London on 16 May. The OnePlus 6 is the latest of the devices that were originally marketed as a "flagship killer", bringing a glass back and plenty of great specs with it. The Samsung Galaxy S9 and larger S9+ design is familiar, because it's essentially the same as the Galaxy S8. That sees a glass rear curving to meet the curved edges of the front Infinity Display. The S9 and S9+ are both IP68 water and dust resistant. OnePlus meanwhile, has traditionally opted for an aluminium build in the past but the OnePlus 6 sees a glass rear this time around, layered for a depth effect. Water resistance has also been added, though no specific IP rating has been detailed. On the front, OnePlus has introduced a notch design display, whereas Samsung avoided it. The OnePlus 6 has a small notch at the top its screen, like the Huawei P20, which means you're looking at minimal bezels on this new phone but the display isn't uninterrupted like the Samsung Galaxy S9. Where OnePlus does have the advantage over Samsung is in presenting a new and fresh design, whereas Samsung stuck with tried and tested. 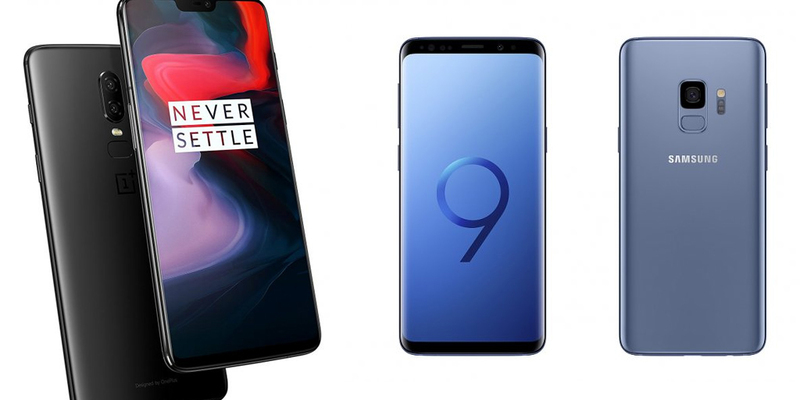 In terms of measurements, the OnePlus 6 sits in between the Galaxy S9 and Galaxy S9+ in both footprint and weight. It is slimmer than both Galaxy models, but wider than both too. OnePlus has been a dedicated user of Qualcomm's hardware and it is therefore no surprise to find the Snapdragon 845 running the show. This platform is supported by either 6GB or 8GB RAM and 64GB, 128GB or 256GB storage options. The 8GB RAM and 256GB storage model is only available on the Midnight Black colour option. There's no microSD on OnePlus phones, an advantage that Samsung holds. Samsung has a version powered by the Snapdragon 845 too, although in the UK its phones run on the powerful Exynos 9810, with 4 or 6GB of RAM (the S9+ getting 6GB). OnePlus is known for its Dash Charging which is really fast and present in the OnePlus 6 too. The battery size is 3300mAh, which is in the middle of the two Samsung devices with the S9 offering 3000mAh and the S9+ 3500mAh. Both Samsung devices have fast charging and both support wireless charging, the latter of which OnePlus does not. The camera is often the area where smartphones are judged. The Samsung Galaxy S9 is a good allrounder with a skill for lower light conditions from its singular 12-megapixel sensor, while the S9+ has an extra 12-megapixel telephoto lens, allowing for the added advantage of 2x optical zoom. Both the S9 and S9+ have OIS, with the S9+ offering dual OIS and both Galaxy devices have a dual aperture system which is technically innovative, although we're not totally sold on it being essential. The S9 and S9+ also offer super slow motion video from their rear cameras and they both come with an 8-megapixel front camera. The camera therefore is the area where OnePlus needs to compete a little harder. A dual camera system is on board the OnePlus 6 with a pairing of a 16 and 20-megapixel sensors. Optical image stabilisation is on board, and the main rear sensor is 19 per cent larger than the OnePlus 5T's main sensor. It is also capable of super slow motion 720p video. On the front, the OnePlus 6 has a 16-megapixel sensor with an f/2.0 aperture. There is no iris scanning on board like the Samsung devices, but the OnePlus 6 does have a Face Unlock feature. Both OnePlus and Samsung run Android devices with plenty of modifications over the top. The Samsung Experience UX is probably the most comprehensive mod that you'll find on any phone, changing pretty much everything about Android, as well as adding more out-of-the-box functionality than any other device. But some feel it's a little too much - Samsung owns that experience - and OnePlus has a slightly different software approach. OnePlus' Oxygen OS is comparable, but preserves a little more of Android, adding a few useful features without such a heavy treatment. When it comes to updates, we think that OnePlus has the slight edge - Samsung isn't especially fast to update Android versions, but OnePlus has a slightly better track record. The real differentiation we feel will be the camera. We can't help feeling that Samsung will offer the better experience here when it comes to functions, speed and absolute quality. However, we'll be happy if OnePlus does raise its camera game - and you can't ignore that price - choosing OnePlus will leave you with cash in your pocket compared to the latest Samsung flagship and the daily experience is likely to be close.